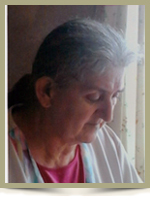 Dolliver, Ann Louise, 58, of Westfield, Queens County, passed away peacefully at home on Friday, March 28th, 2014, surrounded by her loving family. Born in Westfield, she was a daughter of the late Gerald and Adelaide “Avis” (Mansfield) Selig. Ann was a loving wife, mother, grandmother, great-grandmother, sister and friend to many. She enjoyed playing darts, bingo and singing. She was a former caregiver at Meadowbrook Manor. She is survived by sons, Edward, Douglas, Christopher (Christine), all of Ottawa, Ontario; grandchildren, Krystyn, Gerald, Chris, Summer, Rain, Pierce, Winter, Eve, Abbie, Timbit, Zach, Ashley, Dougie, Taylor, Neisha, Sean; great-granddaughter, Lacey; sisters, Enid St. Louis, of Ottawa, Bonnie (David) Joudrey, Victoria Burke, both of Westfield; brothers, Glenn (Cathy), of Bridgewater, Ricky, of Westfield, Terry (Ann), of Pleasantfield. And many nieces and nephews. She was predeceased by her loving husband Herbert; brother Jeffrey, baby Selig and nephew Cody. Our condolences to the family at this difficult time. May you find healing in your memories of Ann. Glen and Cathy so sorry to hear of your loss .We are thinking of you .God Bless. Thoughts of deep and sincere sympathy are with your family at this sad time.God bless all of you. Our sincere condolences go out to all of Ann’s family. We were blessed to meet Ann and Herbie a few years ago in Caledonia and immediately became good friends because of their sincere heart and souls. We will never forget either one. Rest in peace, the both of you, and we will miss our good times together. Rest in Peace Nanna Ann, you will be missed by many. I’m sorry I never got to see you when i was growing up..
Momma Jade Summer Pierce and Winter and I , wish you a great time in heaven. My condolences to the family, sorry for your loss. She was a wonderful person and a good friend. Sending our deepest sympathy to all the family! !May God Bless you all! Our deepest sympathy to Ann’s family and friends at this difficult time. I want to extend my sincere condolences on the loss of your loved one. May you find comfort in the kind words and caring of those around you at this difficult time. So sorry to hear about Ann. When family goes we would love to be there with you not this time. We send all our love and we are thinking of all of you at this time. I am so sorry to hear that you have lost your sister, mother, and grandmother. May each of you be left with loving memories to carry you through this sad time. Please take comfort in knowing all the tears , laughter and warm memories ,stories and music you all shared. Take pride in knowing with all your love and support you made Ann’s time so much easier to deal with I’m sure she is now with the rest of your loved ones and is now at peace. Our thoughts are with you all she will always be in our hearts . Our deepest sympathy to all of Ann’s family and friends at this very sad time of your lives.